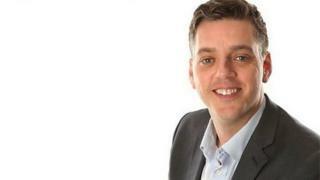 Radio host Iain Lee helped rescue a man who called his show claiming to have taken a drug overdose. The Talk Radio presenter took a call on Wednesday night from a man saying he was dying on a street in Plymouth. Lee kept talking to the man on air for 30 minutes until an ambulance arrived and admitted "I thought he'd died" after "long periods of silence". The man was taken to Derriford Hospital by an ambulance crew and his condition is unknown. Mr Lee tweeted: "He was lying in a street in Plymouth, dying. "We managed to keep him online, get a description of what he looked like and was wearing, work out where he was and send an ambulance and police to him. "Kept him on the phone for 30 minutes while he got harder to understand." He said the call was "intense and upsetting". Many people on social media praised his actions. Frances600 tweeted: "Some people in life make a difference to other people's lives. Last night you were that person." Tammy Brownell tweeted: "You should be proud of yourself. Takes a whole lot of person to be able to do what you did. You saved someone last night it's amazing." Lee tweeted: "Thanks for your kind words. I really hope he makes it." South Western Ambulance Service said: "SWASFT paramedics were called at 11pm, December 19 to Derry's Cross, Barbican, by a radio station who were concerned for the welfare of a patient.